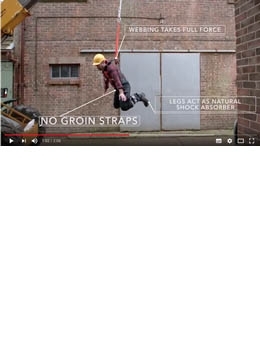 Safety harnesses: They’re a must have, but in the event of a fall they too can pose dangers. Falling while wearing a traditional harness can cause whiplash, spinal issues or hip dislocation, while the straps themselves can potentially cut off the femoral artery, reducing blood flow to the legs. Depending on how you fall, it is also possible for blood to pool in the legs, leading to suspension trauma, which can cause low blood pressure, fainting or even death. However, now thanks to an innovative design from Facelift’s founder Gordon Leicester, ZT Harnesses can offer a model that eliminates the dangers of conventional harnesses while still protecting you in the event of a fall. While it looks like any other harnesses the ZT Harness completely eliminates dangerous groin straps and instead uses a system that distributes the force through the webbing of the harness, down into the legs, which then act as a natural shock absorber. The mechanism of the harness also means that you are suspended in a seating position that allows blood to continue to circulate through the body.